To date over $37,000 has been raised for the families of fallen law enforcement officers through sales of our Irish t-shirts! Thanks for your help! 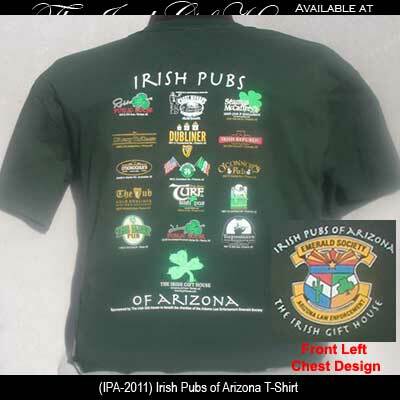 The designs on the back of the Irish pubs of Arizona t-shirt features the logos of Arizona’s finest Irish pubs along with the Shamcus, the shamrock and cactus logo of The Irish Gift House. Additionally, the front left chest design of the Irish pubs of Arizona t-shirt features the Arizona Law Enforcement Emerald Society shield that incorporates the colors of the flags of the United States, Arizona and Ireland. This forest green Irish t-shirt is pre-shrunk cotton and it features full color designs on both the front and back. Arizona Law Enforcement Emerald Society members, who share an Irish heritage, belong to local, county, state and federal agencies throughout Arizona, and are committed to assisting the families of fallen officers regardless of heritage. The logos of 15 of Arizona’s finest Irish pubs are featured on this Irish t-shirt: Casey Moore’s Oyster House – Tempe, O’Donoghue’s Irish Pub and Grille – Scottsdale, The Auld Dubliner Irish Pub and Restaurant – Tucson, The Harp Pub – Mesa, Irish Wolfhound Restaurant and Pub – Surprise, O’Connor’s Pub – Phoenix, Robbie Fox's Public House – Tempe, Johnny Fox's Public House – Peoria, D'Arcy McGees – Tempe, Tim Finnegan's Irish Restaurant & Pub – Phoenix, The Dubliner Irish Bar and Restaurant – Phoenix, Seamus McCaffrey's Irish Pub and Restaurant – Phoenix, Frank Murray's Turf Irish Pub – Phoenix, Rosie McCaffrey's Irish Pub & Restaurant – Phoenix and Irish Republic Public House – Chandler. The Irish Pubs of Arizona long sleeve t-shirt benefits the benevolent work of the Arizona Law Enforcement Emerald Society.